Coast Contemporary is a space for art and a place of encounter that assembles artists and art professionals. It is a journey aboard the Norwegian coast, on the historic ship Hurtigruten and it also takes place in cities along the coast. We aim to show parts of the contemporary Norwegian art scene mixed up with international artists, curators, writers, architects, artist unions, artist organizations, galleries, museums, institutions and the support system around the arts. We wish to straighten bonds, to share, open up and to contribute to a stronger artist economy. The program consists of presentations, panels, lectures, exhibitions, film screenings, and performances by artists as well as Norwegian and international art professionals, institutions, and writers. People, art, ocean, landscape, weather, and food meet while the spectacular Norwegian coast passes by. 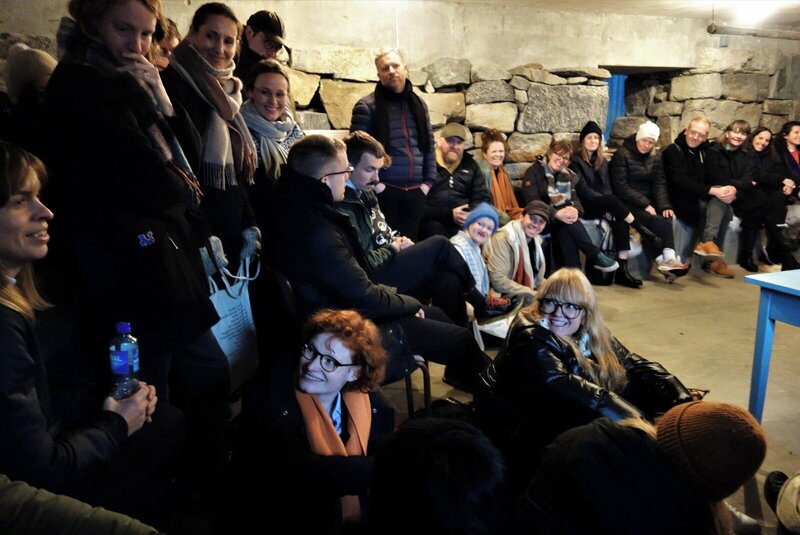 Coast Contemporary is generously supported by the Ministry of Foreign Affairs, the Royal Consulate General in New York, the Municipality of Bergen, KORO – URO, the Norwegian Arts Council, NORLA – Norwegian Literature Abroad and Fritt Ord. Our second edition took place October 21 – 26, 2018. Rugged, weathered, above the sea was curated by Charles Aubin in conversation with Tanja Sæter and took place on Hurtigruten from Svolvær in Lofoten to Bergen. The first edition was co-curated by Helga-Marie Nordby and Tanja Sæter, and took place in September 2017. Coast Contemporary is artist-run and was founded by Tanja Sæter in 2015 and she is the founding director and artistic leader of Coast Contemporary. At the core of Coast Contemporary is the realization that people often need more time to establish a connection and a work relationship and that artists are often not included in the arenas where the decisions are made for the next exhibition programme. As the world spins at a faster and faster pace it is important to slow down and focus to be able to discover and interact. Sharing ideas and artistic visions is more important than ever. A ship was the perfect and isolated arena for Coast Contemporary to allow people to discover new artists, curators and institutions, the support system, the artist unions, meet, slow down, talk, listen and be together. Artists are included at the same level as everybody else for the full journey. Coast Contemporary will hopefully provide something useful, new and interesting to all involved. The trip out to sea starts off in the north of Norway in a small cluster of islands called Lofoten and runs down the coast. We visit Trondheim and end the journey in Bergen in the southwest with visits to different institutions. The ship as an arena for the artistic program provides opportunities for a more cohesive and focused experience. A slower pace allows for more tranquility during conversations and meetings than we usually get at art fairs and biennials, and can create more opportunities for future artistic collaborations. Coast Contemporary aims to be an important link and between artists and the established art scene. We try to make it a little easier to survive as an artist or as a curator by connecting different people working within the arts. Our Arts Council members consists of artist Kenneth Varpe, professor and writer Timotheus Vermeulen and founder of Coast Contemporary, Tanja Sæter.